Tales in Azure and Gold: "The Flying Angel"
Editor’s Note: This story is one of a series of tales about interesting ancestors of Dames. Submissions from Dames are welcome: send to sharriwhiting@gmail.com. 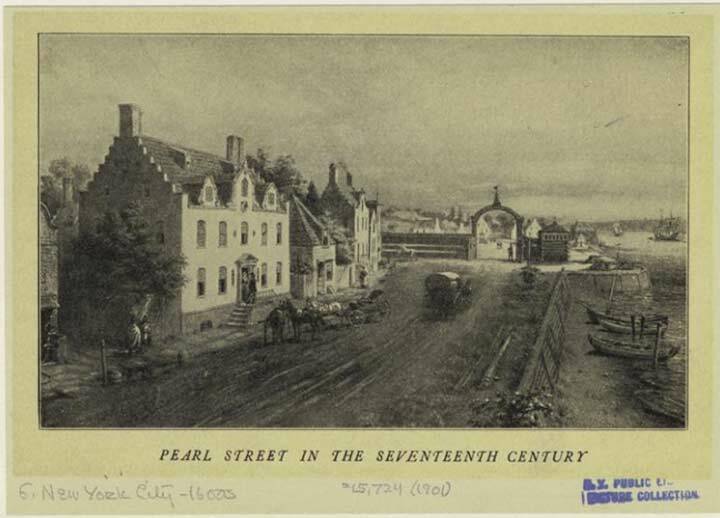 When strolling down Pearl Street during the CDA Walking Tour in April 2018, my mind drifted back to the 1600’s and my Dutch ancestors who lived and worked in that exact area. Genealogy has been a pastime for me for many years and my thoughts ran to my 8th great-granny Magdalena, who was quite a feisty one in her day. She had walked on these streets, creating a bit of mayhem in her own way. Magdalena Dircks Volkertsen Hendricksen Rosencranz, a.k.a “The Flying Angel”, was born about 1638 on the Vigne farm, north of Wall Street in Manhattan. Her grandparents Vinge were original settlers and Uncle Jan was the first boy born in New Netherlands. Magdalena’s first husband, Cornelius Hendricksen, was a sailor, a boat builder and allegedly a privateer. He was killed when Indians started a war to take back Manhattan Island, leaving 21 year old Magdalena a widow with an infant daughter. Two years later, she married the much older Harmon Hendricksen Rosenkranz, a soldier for the Dutch West India Company in Brazil, who had been temporarily appointed to the job of restoring peace with the Indians in the New Amsterdam colony by then-Governor of Curaçao Peter Stuyvesant. After his work was done, Harmon decided to stay. On the day of their wedding, saucy Magdalena and her sister, after some early imbibing, passed the Fire Warden standing in the door of his tavern and mockingly sang: “There is the chimney sweep in his door, his chimney is well-swept.” They were called to court for this affront and fined for insulting a city official. The Dutch at this time were of a litigious nature. Magdalena, her father and two uncles were sued in court for various offenses over the years. Magdalena and Harmon owned a tavern on Pearl Street, The Flying Angel, which was said to be one of the more notorious establishments. Weeks after her street insult incident, Magdalena was notified that Peter Stuyvesant was issuing her the “yellow ticket” for deportation to Holland for “tongue wagging,” a common form of punishment. Other deportees with her were a woman who gossiped and another who had been sent away for public exposure when she mooned another woman in an argument. Harmon eventually joined her in Holland. They remained in Holland for a year, where a son was born to them. They were continuously finagling a return to New Amsterdam. After a great deal of bickering with officials and exchanges of letters with Peter Stuyvesant, they were granted permission to return, provided they did not keep a tavern or sell intoxicants. The directors of the West India Company agreed to allow “Magdalena Dircx, alias the “Flying Angel,” and her husband to return to New Amsterdam, requiring that they lead a “quiet and honest life.” The Dutch apparently did not want them either. Returning to the colony, they moved up the Hudson River to the new settlement of Esopus. Magdalena was said to speak the Indian language fluently. Continual skirmishes with the local tribe did not work well for the settlers. Harmon was captured, stripped and staked out in the sun and others were tortured or burned alive. There were reports that the Rosenkranz couple and others were selling them liquor, even though the Dutch and tribal leaders tried to stop it. Magdalena’s propensity for disobedience continued after the English captured the colony. She managed to insult a much hated English captain and was thrown into the guardhouse. Over the years Magdalena was not always the instigator, but in fact sued others for similar offenses of assault or slander, as did Harmon. Despite all of these escapades Magdalena and Harmon managed to accumulate property and wealth and produced nine children. Magdalena outlived Harmon by three decades, finally meeting her maker in 1726. It makes one wonder what St. Peter thought of this Angel from Pearl Street when she was met at the Pearly Gates.